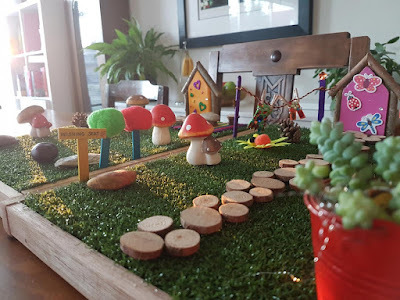 I am a very lucky girl as Tilda and I have been to visit two fairy gardens recently. 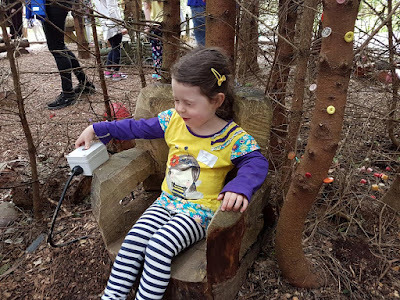 Last week, when we were on holiday, we went to Alnwick Gardens which has a fairytale treasure hunt in it. I have already blogged all about that in A Garden of Fairy Tales so click on the link to go read all about there. Last month we also visited the Fairy Woodland Experience in Balfron which I want to tell you all about. When you arrive you get a map to guide you around the woodland and there are cute little log with arrows all around the paths to keep you in the right direction. 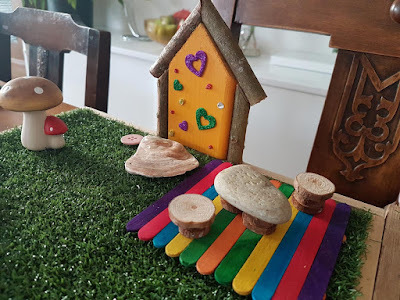 On the day we arrived there was a bit of a panic as the key which opens all the fairy doors had been lost and it was up to us to find it and make sure the fairies could get back in and out of their doors! 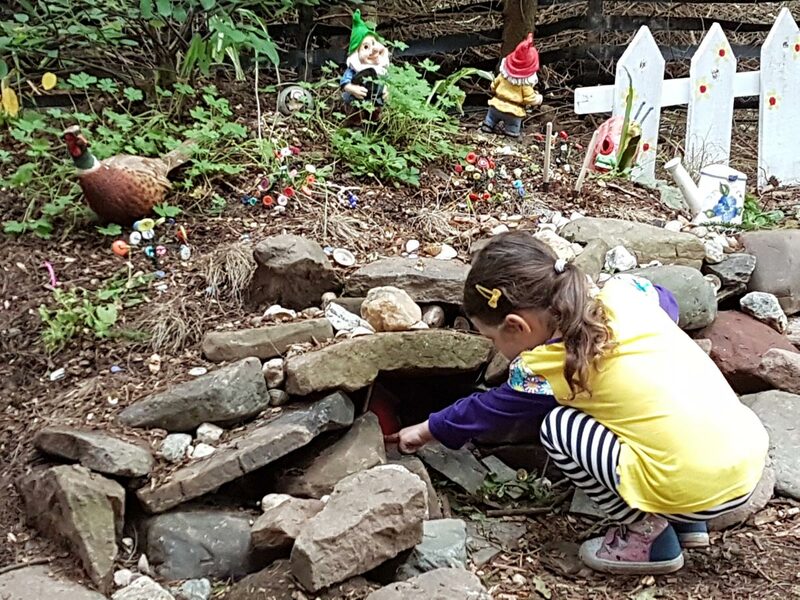 When we arrived at the Fairy Village we were met by two real life fairies.We were given our fairy names (my name was Rose River and Tilda's was Glimmer Thistle, cute huh?) and some quiz sheets. On the treasure trail there was a lot to find such as who lived behind the pink door and who lived at number 72. Thankfully we managed to find the missing key (phew) so that solved that crisis. In the village there was loads to see and do - lots of fairy doors to spot, a wishing chair, a worry tree and loads more. 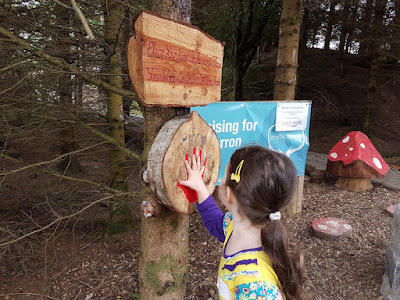 We carried on round the larger woodland walk and found lots more fairy doors and it was a pretty walk through the woodland. We even stopped for a wee picnic on our way. Back at the hub there was free tea, coffee, juice and biscuits as well as colouring in to do. There's also a cute shop selling lots of lovely fairy merchandise. My grandma bought Tilda and I fairy doors which we used to make our fairy garden which I will tell you about in a minute. 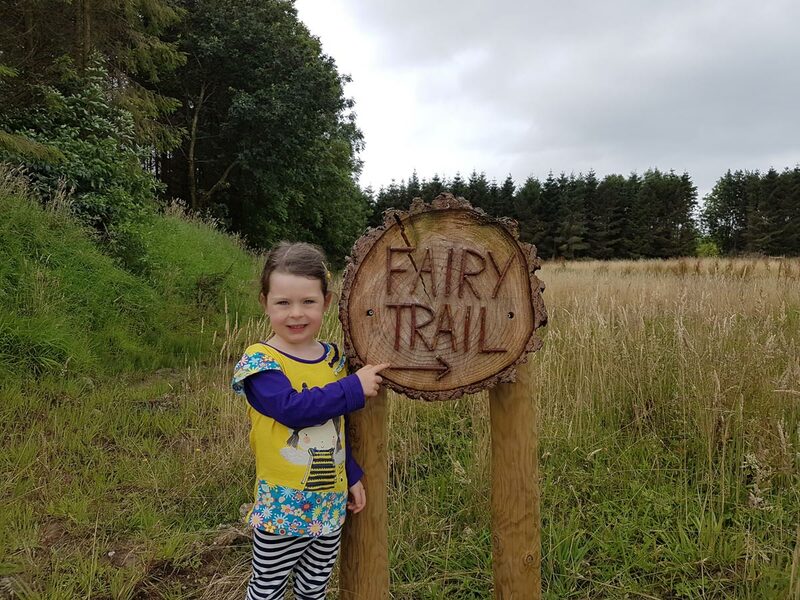 We would HUGELY recommend the Fairy Trail. 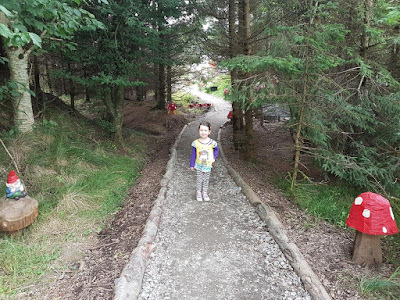 It is only £4 per person (under 2s are free) and we spent hours and hours there. 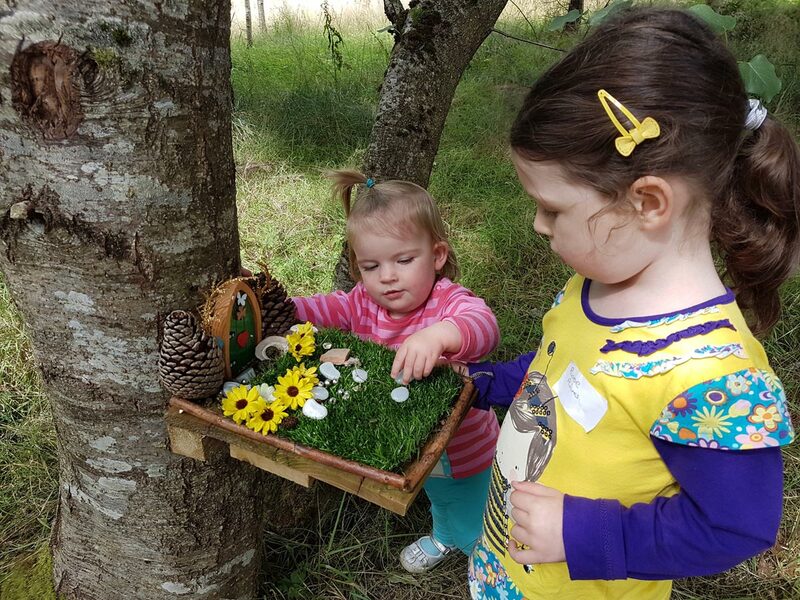 It is open Thursdays and weekends through September and open through the October school holidays. It will then become the light experience and then the Santa experience before the fairies allow us back to visit again from next March. 1. My clever daddy made me a wooden frame for my garden. You could use a tray or even an old shoe box would work. 2. 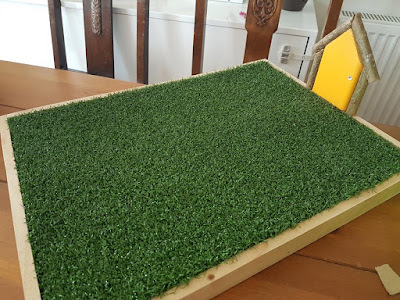 We had some off-cuts of artificial grass which we cut to size. 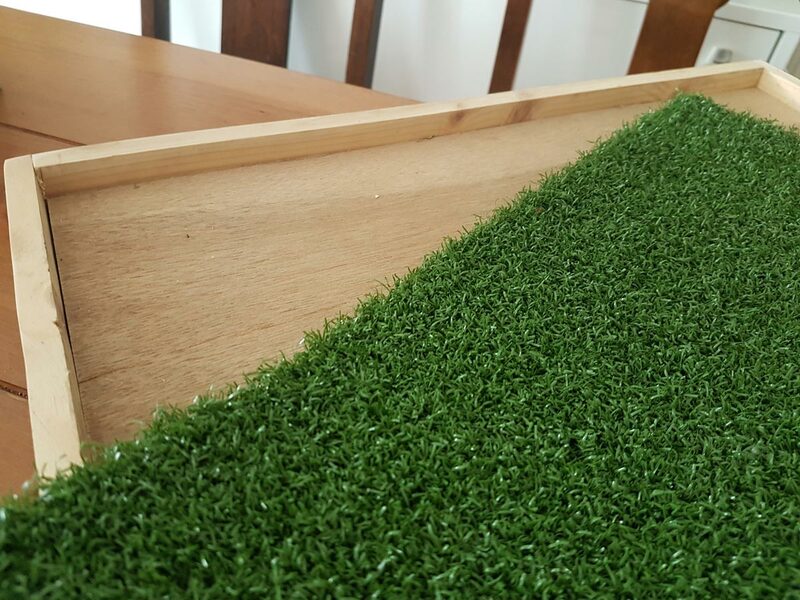 You could ask your grown up to send off for a sample of artificial grass which you could use. 3. We decorated our fairy doors with the stickers which came with them and glued them to our frame. 4. We then went wild and designed our garden. Luckily I could get some top tips from M&D who are garden designers. They said we needed to allow a path to the door and somewhere to sit. 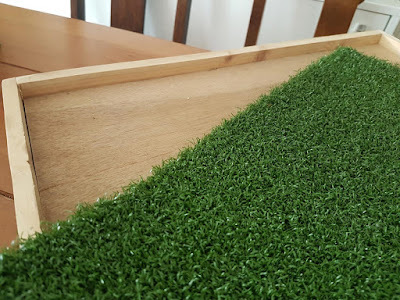 I made a hopscotch path and we made decks out of lollipop sticks! I made a pond from some mosaics as well as some trees. I found some flowers and used pine cones as shrubs. I also made a wishing seat from a painted stone and made a sign. 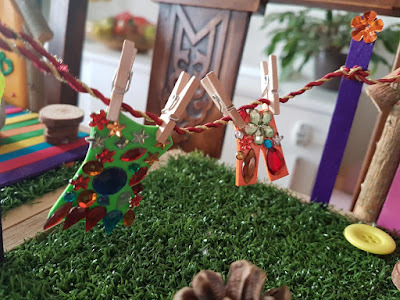 I even made a washing line and some glittery clothes for my fairy! Tilda made some cool garden furniture using little wood circles and stones. 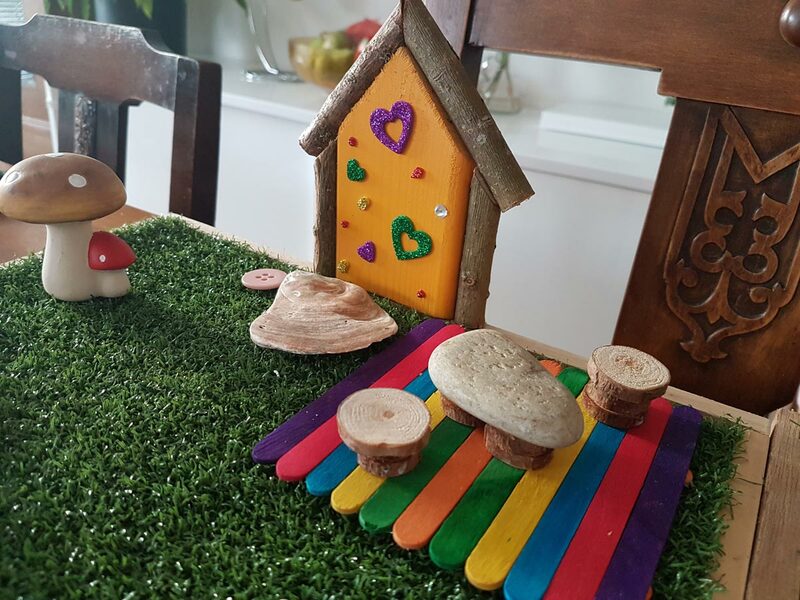 Some toadstools finished off our gardens perfectly. We left buttons outside our fairy doors so fairies know it is empty and they are welcome to come and live there. I hope some come to visit soon!